No one has a child hoping that they will have problems and difficulties in life – that would be absurd. We want our kids to fit in with their peers, have friends, enjoy their childhoods and do well at school but sometimes life doesn’t dish up exactly what we were expecting. Seeing your kid on the edge of things struggling to join in is a painful experience as any of us who have been in that position can testify. 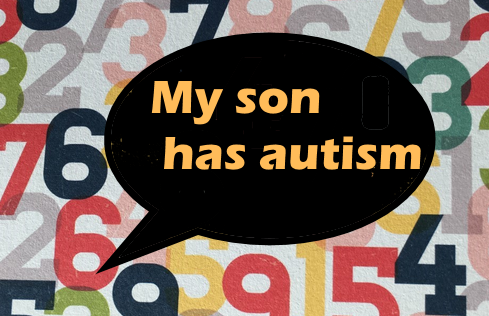 When Edward was first diagnosed as having Asperger’s syndrome it didn’t come as a surprise to me as I had suspected that he was on the spectrum on and off for quite a number of years. It was more of a shock for Nick and I remember him asking the psychologist who gave us the diagnosis for a percentage score of how autistic Edward actually was. The conversation went into a strange loop with the psychologist unable to give a precise figure and Nick struggling to get a handle on the situation without some tangible score. When we got home we contacted both sets of our parents and let them know. Then we had to work out who else to tell and in which order. Edward was 8 years old at the time and it seemed only appropriate that seeing as he was old enough to understand he should know about his diagnosis before anyone else and so we sat him down and told him. I’ve written about how we did this and how Edward reacted here. Nick and I both agreed that school staff needed to know. After that it became more tricky as we wanted to tell our friends but were aware that if we did so some of them would inevitably mention it to their own children and we wanted Edward to be settled with his diagnosis before he had other children asking him about it. Nick also needed a bit more time to get his head around it first. In the end once we’d had a bit more time to digest the information as a family we did start to tell our friends and sure enough one family must have talked about it in front of their own children as Leila came home from school reporting that one of our friend’s kids had asked, “Has Edward got autism?” . We were just very glad that we had sat our own kids down and explained autism to them first because I wouldn’t have wanted any of my kids hearing about Edward’s autism as if it was something scary and frightening. Edward didn’t want his primary school class to be told about his diagnosis although this was something offered to him by support staff. Towards the end of primary school Edward was open to letting family friends know about his diagnosis. 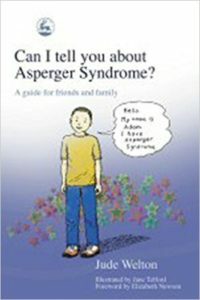 We found a very useful book called “Can I tell you about Asperger Syndrome?” by Jude Welton; a short read which can be read by children and time pressed adults alike. It gives a quick overview of what it is like to have Aspergers from a child’s perspective. Quite a few family friends read the book and I think it gave them more understanding and patience towards Edward. Once Edward reached high school I realised that a real shift had occurred in terms of how he viewed his autism diagnosis. He wrote this when he was 13 years old. If you are telling people about your child’s autism I think it is worth pointing out what their strengths are as well as their weaknesses. I recommend letting people know what things will help them stay calm, what things they will enjoy and what they will be motivated by rather than only focusing on the negatives. Taking this approach is a more positive way of explaining who your child is and what they need. 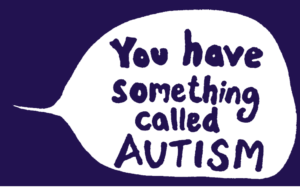 A few months ago I read an article about a 19-year-old boy who had been diagnosed with autism as a young child. His parents had kept his diagnosis a secret from school, friends and even grandparents. They claimed that they had successfully managed to help their son pass as “normal”. I do wonder how on earth they did this – and I also worry about the mental toll this had on their son. I want Edward to know he has autism. I want other people to know and understand what this means and I don’t want him to have to hide. Our kids will become adults sooner than we can imagine and a world where autism is less stigmatised will be a better place for them to flourish. Although I would never wish any of the difficulties that Edward has experienced through his autism on him, he simply wouldn’t be the interesting character that we know and love if he wasn’t autistic The challenges he has faced have forced him to develop buckets more self-awareness, reflection and perseverance than I had at his age and I can’t help but hope that this will stand him in good stead for the coming years. This was really interesting to read. I am not sure how will will manage letting our E know. He was diagnosed at 2 yrs and 9 months and everyone close to him knows. I guess there will be a moment when we might need to discuss it with him directly but I am not sure when that will be or if he will understand what it really means. Thanks so much for linking with #spectrumsunday. We hope you come back next time. My son have autism and artistic and motor tic speech delay anger need help Advice no one play with him they treat him different they don’t want be by him hurtful he cries say I don’t have no friends a lot it’s hard!